Pinocchio, a magical theatrical production from Tout à Trac, takes us on another amazing journey into the heart of childhood and imagination. 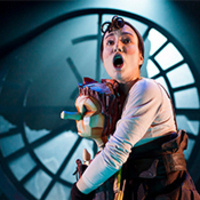 Following the internationally acclaimed Alice in Wonderland, Tout à Trac revisits Collodi’s tale about the world’s most famous puppet: Pinocchio. Featuring “Gepetto's Workshop” Together with Trish Helsel, K.C. Bonker's, and the Portage Lake District Library, the Rozsa will be hosting an interactive puppet workshop, featuring an on-stage tour of the Pinocchio set, a shadow puppet theatre, and a “sock-puppet creation-station” in the Rozsa lobby, complete with refreshments and puppetry-themed fun for all ages!